History has been made at the Rugby League World Cup with all four Pacific Island nations advancing to the quarter finals. 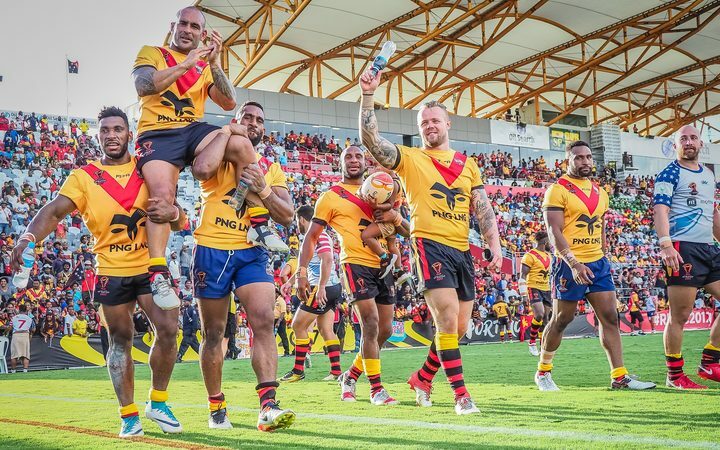 Papua New Guinea romped to a 64-0 victory over the United States on Sunday evening to complete a clean sweep of their three games in Port Moresby and book a last eight showdown against England in Melbourne.The Kumuls last reached the quarter finals in 2000 and coach Michael Marum was full of praise for his side following their biggest ever test win. "We have to celebrate this win - I'm really proud of the performance of the boys the last three games there," he said. "Quarter finals a bit different football so we've got videos, we've got tactics to prepare - we've got a full week in Melbourne next week - so really proud of the performance the last three games. "I think we played nearly everyone - we have 23 in the side - so it's good to see whether they played one or two games they really stood out. "[It's a] headache one me now selecting the side for the next game." Toa Samoa face an imposing clash against defending champions Australia in Darwin, having squeaked into the playoffs on points differential following a 14-all draw against Scotland on Saturday. The fifth ranked Samoans reached the playoffs despite failing to win any of their group games, following earlier defeats by New Zealand and Tonga. Coach Matt Parish admitted they would not come close to the Kangaroos on current form but remained bullish about their potential. "Listen if we play well we can compete with anyone in the world," he said. "If we hold the ball we will compete against anyone in the world but at the moment, unfortunately, what we're doing on the training field isn't translating onto the footy field. "Tonga have definitely shown the way (for Pacific teams) but again if we didn't make mistakes last week I've got no doubt we would have beaten them." Tonga's stunning 28-22 upset of New Zealand earlier that evening ensured the Group B winners a more favourable quarter final match-up against Lebanon in Auckland. The Kiwis will instead take on Group D winners Fiji in Wellington after the Bati defeated Italy 38-10 on Friday to top Group D.